When Facebook launched the Page option, the hype of ‘Like,’ button began and it is still an ongoing addiction. We begin to click like on almost everything from our favorite celebrities to activities to books and other random things. 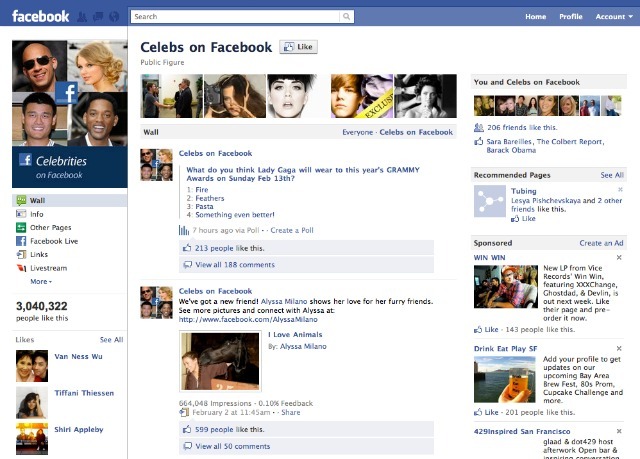 Facebook has finally launched the new Facebook Page which will operate like a user profile. “We strongly believe you should have consistent experiences when possible,” Rohit Dhawan, Product Manager of Facebook explained to the team of Mashable. In favor of the redesign Facebook Profile, the old tabs on top will be removed and Facebook Page will be with a new navigation menu. Administrators of the Page will be able to log in to Facebook via Log in as Page; this will give them a chance to post comments on Facebook Pages directly as the Page. “A page can now use Facebook as if they were an individual with the ability to interact with other pages,” said Dhawan. This option is only limited to pages, admin cannot use the Facebook Page to post on people’s walls or statuses. Similar to the Facebook Profile, the top of the Facebook Page will be the photo roll and on the ride hand corner, users can now see how many friends ‘liked,’ the page. One interesting feature that got me wondered why is Page’s ability to filter out wall posts that are not in the language that you speak.